When I visited Delft this summer it was years ago I bicycled to the nearby tiny village ‘t Woudt, which means literally “The Wood”. However, ‘t Woudt is situated in the polders to the west of Delft, and you will not detect any wood in my pictures. In fact I would have dearly liked to take more photographs on one of the few sunny afternoons of this summer, but the battery of my camera got empty. The tiny village, a hamlet is a more apt word, is dominated by the imposing medieval church. The buildings in ‘t Woudt are rightly classified as monuments. The church looks rather formidable because its tower has been inclosed by the extended side-aisles. I added on purpose the detail that I took a bicycle to reach ‘t Woudt, because the road to Wateringen behind the church is not open to cars. The N223 road from Delft to De Lier and other villages has an exit for ‘t Woudt, but you can drive only the few hundred meters to this lovely spot, within two kilometers of the A4 highway connecting The Hague to Delft. For weeks I have been thinking what kind of story is behind ‘t Woudt. The first story is partially a story of onomastics, the auxiliary discipline that deals with the etymology of names. Toponymy is the study of place names. 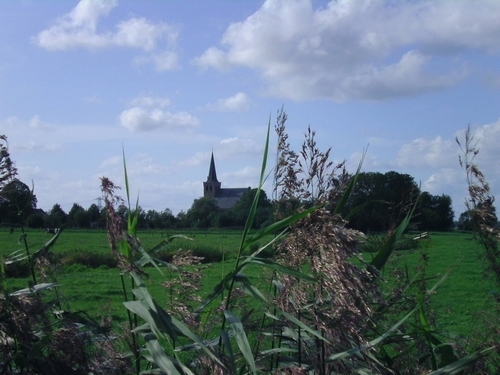 ‘t Woudt is now a part of the municipality Midden-Delfland. Originally it belonged to the manor Hof van Delft, literally “Garden of Delft” or “Court of Delft”, for the most part now a neighbourhood of Delft itself. To the south-west of Delft is another place name with a wood in its name, Abtswoude. Toponymical studies have shown this name was formed by an act of popular etymology. The medieval name was Popta’s Woude, “The Wood of Popta”. In the nineteenth century this name had been transformed to Papswouw. People thought this place name meant “the wood of a priest”. In a funny way they decided to upgrade the place name to Abtswoude, “Abbot’s Wood”, because of the popular belief in the existence of a monastery on this spot in medieval times. Now it is very difficult to imagine actual woods in a classic Dutch polder. In this fen country a wood can hardly exist. Perhaps to add to the confusion about Abtswoude, and to create a new chapter in Dutch landscape planning, a land art project near Abtswoude was started in the late twentieth century in the form of a wood surrounding a hill of only five meters. The wood is called the Abtswoudse Bos, and the core of the project is even called Moeder Aarde, “Mother Earth”. The whole area of just 190 hectare is situated on the outskirts of Delft. The A4 road reaches from The Hague Delft only to stop in the midst of the polder. After decades of discussions, protests and several juridical procedures at the judiciary branch of the Raad van State, the highest advisory council of the Dutch government, on July 6, 2011, it was finally decided to build the missing six kilometers of this highway to Rotterdam. The new part of the A4 will run at a distance just 1500 meters from the Abtswoudse Bos. The Raad van State has also the role of a court of appeal in cases concerning administration. Lately the double role of the Raad van State, founded in 1531 by Charles V, becomes more subject to criticism because it is a clear example of a situation – governed by the special law for the Raad van State (1962) – in which the governing power has to be separated from the judiciary. The court branch has to judge cases which have been discussed in or which were advised upon by the council itself. In October the Raad van State opened its renovated building. Surely the external renovation with a better use of its palace in The Hague at the Kneuterdijk was needed and successful, but an internal renovation, too, is needed to survive and function properly in this century. The Dutch queen is formally the head of the Raad van State, but the vice-president leads in daily practice the council. Due to their position the vice-presidents have got nicknamed viceroy of the Netherlands. These months the nomination of a new vice-president is another point of debate. Instead of being aloof to party politics the vice-president’s function might get more politicized. Having brought together a medieval hamlet, a romantic belief in the existence of a medieval monastery, a newly planned wood and land art project, and the completion of the final trajectory of the A4 I do not know whether to smile or to shake my head in disbelief. The Dutch polders can show you a rich variety of different landscapes. It seems most practically to keep in mind Dutch landscapes have been shaped and are being shaped by man. One could almost suggest the neologism manscape… Between The Hague and Leiden you will find the artificial lakes of the Vlietlanden directly next to the A4. The high-speed railway between Amsterdam Airport and Rotterdam was custom-built with a number of tunnels to protect the scenery of the classical Dutch polder as much as possible. Interestingly a separate institution has been founded to deal with complaints about damages caused by this railway. In daily life you have to picture the densely populated province of South Holland as an amazing mix of villages and towns surrounded by the remains of polders and more graphically by railways and highways, with to the east the largest more or less intact polder zone, the archetypical Groene Hart, the Green Heart of the Netherlands. 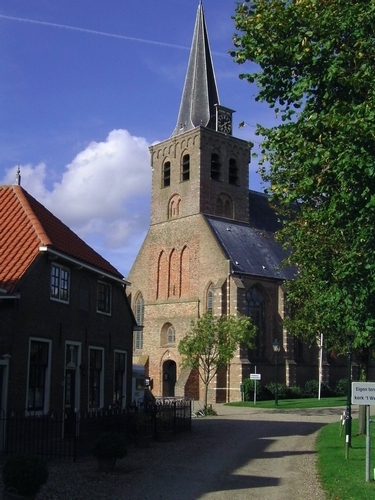 As for medieval monasteries around Delft, to the north-east of Delft is Sion, now part of Rijswijk – the Ryswick of the 1697 peace treaty -, the spot of a monastery of Austin Canons, founded in 1345 and demolished in 1572. The canons found around 1490 a Roman milestone near Monster in the Westland region. A part of the grounds survived as an estate long owned by the Van Hogendorp family. Gijsbert Karel van Hogendorp (1762-1834) helped in 1813 decisively in creating the Kingdom of the Netherlands, sketching a draft for the new constitution – subsequent versions of the Dutch constitution can be found here – and getting the family of Orange-Nassau on the new Dutch throne. I had hoped to find more information on individual monasteries in the lavishly illustrated volume De middeleeuwse kloostergeschiedenis van de Nederlanden [The medieval monastic history of the Low Countries], edited by Paulina de Nijs and Hans Kroeze (Zwolle-Ter Apel 2008), but this is not the case. Characteristically romantic phantasy lacked geographical precision. I suppose I will hardly succeed in cycling around Delft in one day to visit all places mentioned in this post. Hopefully there is enough here for reflection on the facts and stories presented. This entry was posted in Landscapes and tagged Legal history, Nature, Netherlands, Public law on November 3, 2011 by rechtsgeschiedenis.